Any Old Irons is part of Football Friends, a programme run jointly by Friends of the Elderly and West Ham United Foundation, to bring together older supporters of West Ham Football Club. Through previous work with Lee and Stort Boats, based at the Olympic Park in East London, we were asked to partake in some Christmas filming for The One Show who were putting together the ‘twelve days of Christmas’ using community groups across the country. 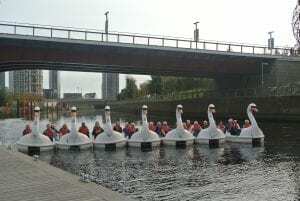 Our Any Old Irons participants were ‘seven swans a swimming’ on Lee and Stort Boats’ giant swan pedalos. The day was filled with smiles and laughter as the group jumped aboard the pedalos and lined up to sing the popular Christmas tune. They even became somewhat of a tourist attraction with people visiting the park and some got involved in the festivities by singing Christmas songs along with the group. Thank you to The One Show for including us in the show on Friday 22 December, you can watch the episode we starred in again here. Also thank you to all of our wonderful Any Old Irons participants who took part, West Ham United Foundation and Lee and Stort Boats. A fantastic day had by all! If you would like to find out more about our Any Old Irons Football Friends programme, click here.